Dave Luff and I are putting on a game for Operation Market Larden 5, a wargaming event being held in Evesham in a few weeks time. We are once again running a Big Chain of Command game in 15mm. The scenario is an adaption of a scene from one of Dave’s favourite war films, which meant that we needed a small town with high walls – something which we didn’t have. 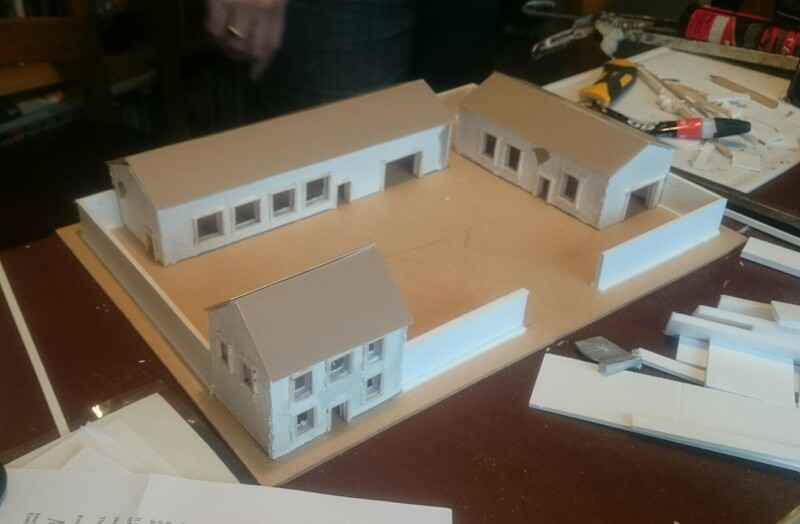 Rather than buy buildings and walls, we decided to scratch-build the vast majority of what we needed for the game. As it turned out, we also needed several sheets of embossed plastic, which I obtained from Antics Online. One of the first jobs was to build a large number of high walls (10′ high in 15mm scale) – I’ve built 18′ in total, which will (hopefully) be enough. The walls are built from 3mm foamboard, with the idea that they will be rendered using filler. I then had the crazy idea that many of the walls would have patches where the brickwork showed through, and so several hours were spent cutting and gluing pieces of embossed plastic brickwork to the walls prior to them being rendered. At the same time, I also built several walled gardens and courtyards for some of our houses. Some would be rendered, whilst others would be brick. Meanwhile, Dave set about building a couple of larger structures. We wanted a raised, walled churchyard – this was built using several sheets of 5mm foamboard on an MDF base, which was then surrounded with embossed wall sheets from Plast Craft Games. (I had a set lying around which I hadn’t found a use for). There’s still a fair amount to do at this stage – Dave is building a chimney for the brewery, and I need to render all the walls that I have made and apply coping stones before we can start the painting process. We’ve also have to build a cobbled town square, which will need another couple of sheets of embossed plastic. Whilst this will cost a few pounds it will work out far cheaper than buying the Flames of War scenery pack. All being well, our next update should see all this white scenery completely transformed as we start painting. Very cool project, looking forward to the finished pieces. I always appreciate scratch-builds and as far as I can see they look as good if not better than pre-made houses.